The commercial and cultural center of the eastern part of Idaho, Idaho Falls is also the state's second biggest city after Boise. Idaho Falls is the county seat of Bonneville County and is situated not far from the state's border with Wyoming. The city covers an area of 23.14 square miles and has an estimated population of over 61,000 people, with around 145,000 people living in the surrounding metropolitan area. The area that would eventually become Idaho Falls was first just a small group of ranches and farms, with the first real foundations of the city occurring in 1864. A man called Harry Rickets constructed a ferry and set sail on the Snake River, boosting transport links and migration towards the Idaho Falls area, where a toll bridge was constructed. A hotel, post office, and bank were added to the area, with many people traveling along the Montana trail and choosing to settle in Idaho Falls. The town was originally known under the names of Taylor's Crossing and Eagle Rock, before eventually becoming Idaho Falls in 1891. Nuclear reactors were constructed in the area in the mid-20th century and energy became a key part of the city's economy. Nowadays, the city relies on the Idaho National Laboratory for most of its high-income employment, but many other small businesses can be found around Idaho Falls and various neighborhoods have undergone renovation over the years. The city is regarded as a great place for families and has a lively arts and culture scene, as well as serving as a great base for nearby national parks like Yellowstone and Grand Teton. Elevation tells us how high or low an area is in relation to sea level and is a key geographical statistic with many uses. The mean elevation of the United States is 2,500 feet (760 m), but many of the country’s biggest cities and urban locations are situated in low-lying coastal areas with elevations that tend to be lower than 500 feet (152 m). The elevation of Idaho Falls is 4,705 feet (1,434 m), meaning it's nearly twice as high as the national average and several thousand feet higher than the country's biggest cities like Chicago, Los Angeles, and New York. Idaho is the sixth highest state in America, trailing behind Colorado, Wyoming, Utah, New Mexico, and Nevada. It has an average elevation of 5,000 feet (1,520 m), which is double the national average. This means that the city of Idaho Falls is just a few hundred feet lower than the state average. The point with the highest elevation in all of Idaho is Borah Peak, a mountain in the Lost River Range, which has an elevation of 12,668 feet (3,861 m), while the lowest point in the state is the confluence of the Clearwater and Snake rivers, which is situated at an elevation of 713 feet (217 m). The highest city in all of Idaho is Island Park, which can be found in Fremont County and has an elevation of 6,290 feet (1,917 m). Elevation can vary quite widely among the major cities of Idaho. The state capital of Boise, for example, has an elevation of 2,730 feet (830 m), while another of the state’s biggest cities, Twin Falls, is situated much higher at an elevation of 3,743 feet (1,141 m). This means that Idaho Falls is actually one of the highest major cities in the entire state. Weather in the city of Idaho Falls is influenced by its high elevation, with temperatures regularly dropping below freezing point through the winter months. The city receives around 44 inches of snow each year, with most of this falling from November through to February of each year. The city gets around 11 inches of rain as well. The coldest month of the year is January, with average lows of 12°F (-11°C), while the warmest month is July, which has average highs of 86°F (30°C). One of the key attractions of Idaho Falls is its river walk, offering various open-air art installations and several cycling and hiking trails along the Snake River. Other major attractions include the Museum of Idaho and the Idaho Falls Zoo, as well as various art centers. 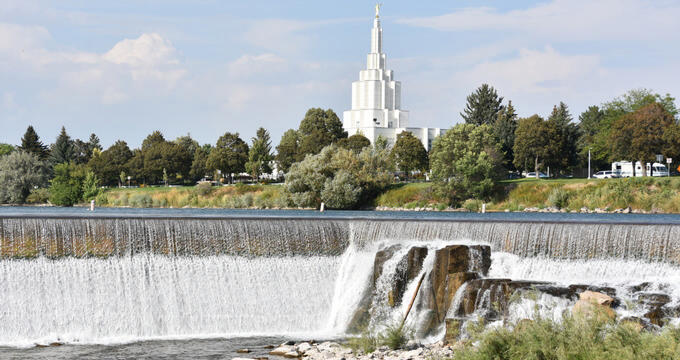 Many tourists also visit Idaho Falls as a base for their adventures in nearby Yellowstone National Park and Grand Teton National Park, both of which offer a multitude of activities like climbing, hiking, camping, fishing, and more.